Craiglist is the biggest free online marketplace in the world that allows users to buy, sell, barter and connect with each other. The following is a re-design of the Craigslist app built to allow the user to intuitively and delightfully experience it’s vast marketplace. 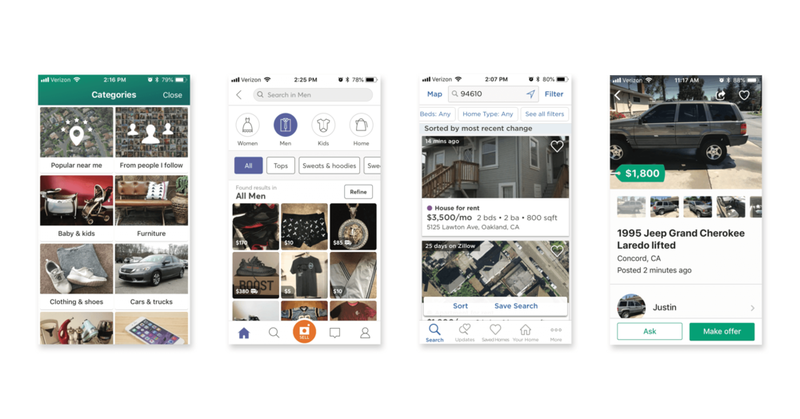 How might we create a mobile experience for Craigslist user’s that allows them to search classifieds in a seamless, intuitive and delightful way? "I use craigslist all the time. It’s pretty much the only thing I use to find an apartment and is pretty simple. But It’s not something I think about using on my phone. I wish there was a way for me to use it on the go in the same simple way." Based on the current flow of the app it is clear that in the redesign I needed to rethink use of icons, hierarchy, and accessibility. I used Jakob Nielsen's 10 Usability Heuristics for User Experience to guide my analysis. Looking at competitors such as OfferUp, Zillow and Mercari it is clear that the standard in a classified mobile experience is a simple screen with clear call to actions, variety of search result views, and detailed filtering options. How might we use icons and copy to eliminate the need for the user to think? How might we use hierarchy and content chunking to allow the user to more easily scan for the information they are looking for? How might we enable the user to return to listings and searches that they find valuable? I used a card sorting exercise to more fully understand Craiglist's current information architecture and to tweak it to make it more intuitive. I then created a simplified Information Architecture focusing on one specific user flow task: searching for an apartment to rent. I created a Moodboard based on applying a modern style that would still feel familiar to current Craigslist users. The subdued blues and purples align with the original style. The type is clean, well-balanced, and includes clear hierarchy. Icons are simple, clear to understand, and not overwhelming. Click here to check out the clickable prototype. In working on this project I noticed that a main reason people don’t use Craigslist is the associate between it and scams. To improve the experience of Craigslist user’s I’d explore the ways in which we can make it a more trustworthy service. Craigslist is used for many different types of classifieds. In this project I focused mainly on apartments. I’d like to explore implementing a classified template that can be universally used across all types of classifieds.